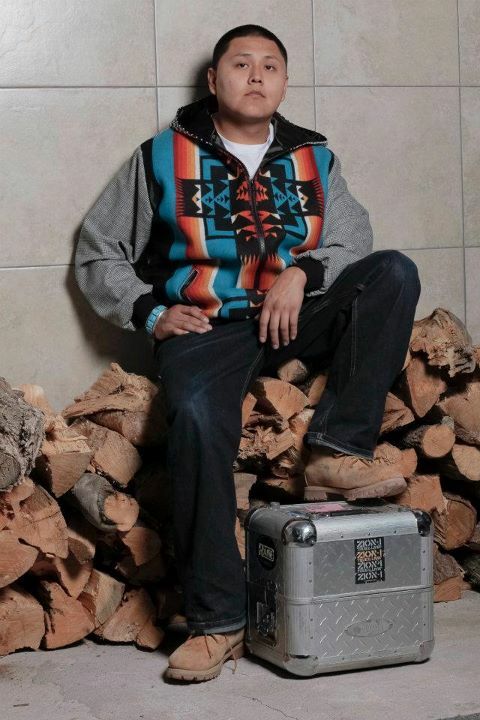 Miigwaans Cameron models a Pendleton Leather Graff Zip-up by Sho Sho Esquiro Clothing, and large beaded hoop earrings and beaded bracelet by Turquoise Soul. Hair and Make-up by Wabanoonkwe Cameron-Hernandez. Photo by Anthony Thosh Collins. Location: Cochiti, NM. Amberae Wood models a long-sleeve print dress by Sho Sho Esquiro Clothing, and extra-long bangin' beaded earrings by Turquoise Soul. Extra-long legs by Amberae Wood. Hair and Make-up by Wabanoonkwe Cameron-Hernandez. Photo by Anthony Thosh Collins. Location: Cochiti, NM. Amberae Wood models a High Waisted Skirt with Leather Ruffle by Sho Sho Esquiro Clothing, and extra-long beaded earrings and necklace by Turquoise Soul. Hair and Make-up by Wabanoonkwe Cameron-Hernandez. Photo by Anthony Thosh Collins. Location: Cochiti, NM. 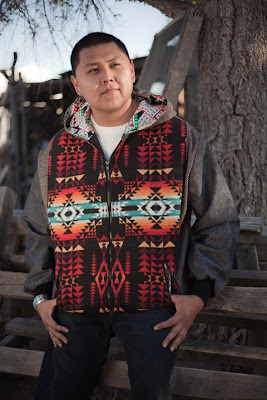 DJ Young Native models a Men's Pendleton Jacket by Sho Sho Esquiro Clothing. Photo by Anthony Thosh Collins. Location: Cochiti Pueblo, NM. 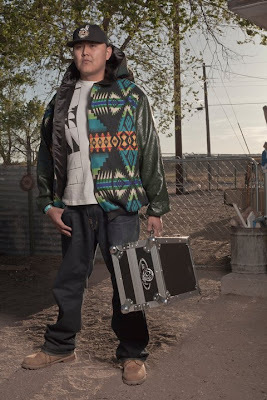 DJ Young Native models a Men's Pendleton Jacket with Leather Sleeves and a Fitted Beaded Hat with 14K Gold Beads, both by Sho Sho Esquiro Clothing. Photography by Thoshography. Location: Cochiti, NM. 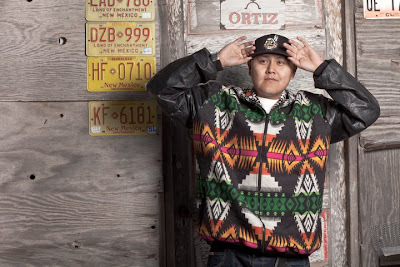 DJ Young Native models a men's Pendleton jacket, custom t-shirt, and beaded cap by Sho Sho Esquiro Clothing. DJ equipment is model's own. Photography by Thoshography. 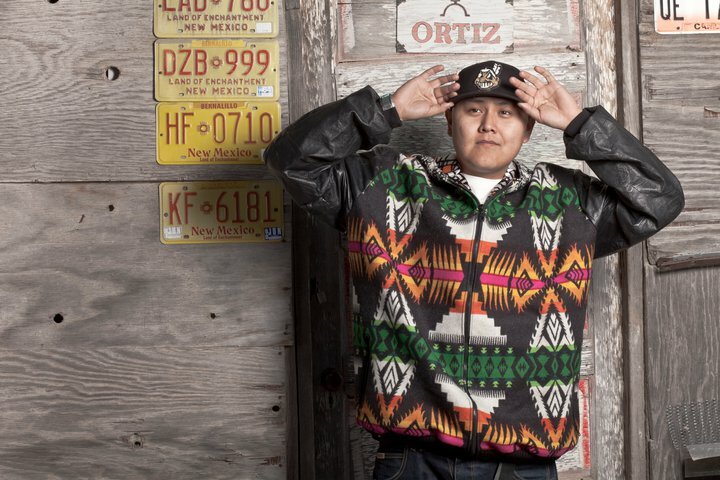 Location: Cochiti, NM. DJ Young Native models this Pendleton Jacket by Sho Sho Esquiro Clothing. Bingo card print on the inside of the hood. Photo by Anthony Thosh Collins. Location: Cochiti Pueblo, NM. Miigwaans Cameron models a Black Leather Top with Carved Bone Feathers and Sterling Silver Beads by Sho Sho Esquiro Clothing, and Turquoise Soul earrings and necklace. Hair and Make-up by Wabanoonkwe Cameron-Hernandez. Photo by Anthony Thosh Collins. Location: Cochiti Pueblo, NM.